The mission of the Department of Health, Physical Education, and Recreation at the University of North Alabama is to enhance the quality of life for the general citizenry through the promotion of active and healthy lifestyles and to facilitate mastery of knowledge and development of attitudes, behaviors, and skills reflecting expertise in the field. With this preparation, graduates will be prepared to assume leadership roles associated with development, implementation, and administration of programs in physical education, exercise science, fitness, health, recreation, and sport management. In addition, graduates will have the foundation necessary to successfully pursue advanced training, certifications, and academic degrees. The Department of Health, Physical Education, and Recreation offers four bachelor degrees: a Bachelor of Science in Education (BSEd) in P-12 Physical Education, a Bachelor of Science (BS) in Health, Physical Education and Recreation, a Bachelor of Science (BS) in Exercise Science, and a Bachelor of Science (BS) in Sport and Recreation Management. The Bachelor of Science in Education is designed for students interested in becoming a physical education teacher and leads to qualification for recommendation for the Alabama Class B Professional Certificate at the P-12 level in Physical Education. The Bachelor of Science is a non-teaching degree. The Bachelor of Science in Health, Physical Education and Recreation offers concentrations in Fitness Management and Health Promotion. The Bachelor of Science in Exercise Science offers concentrations in Applied Exercise Physiology, Clinical Exercise Physiology, and Pre Professional Studies. The Bachelor of Science in Sport and Recreation Management offers concentrations in Sport Management and Recreation. The department also offers minors in Exercise Science, Fitness Management, Health, Health Promotion, Outdoor Education, Community Recreation, Coaching and Officiating, and Sport Management, which may be applicable to other majors requiring a supportive minor. In addition, the Department of Health, Physical Education, and Recreation offers physical education/recreation activity courses which are available as elective credit to all students who wish to develop skills for personal pleasure or lifelong physical activity. All students pursuing a degree in the Department of Health, Physical Education, and Recreation in both the BSEd and BS degree programs are required to successfully complete a senior portfolio and an internship prior to graduation. Students must apply for the internship one semester prior to registering for the internship experience. The senior portfolio must be completed during the student's final semester of undergraduate studies. The Department of Health, Physical Education, and Recreation is located in Flowers Hall, a $2.5 million health and physical education facility. In addition to the physical education activity areas, the facilities include a Human Performance Laboratory, Wellness Center, and swimming pool. 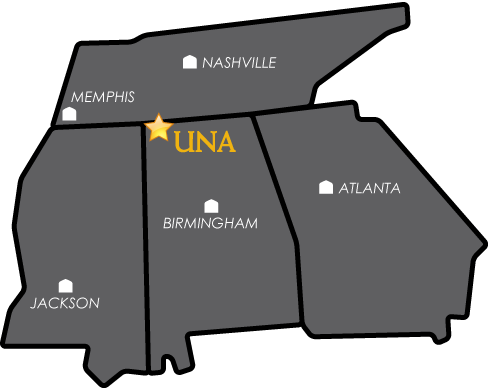 The HPER Department has also been designated as the UNA Wellness Research and Service Center. Faculty in the Department of Health, Physical Education, and Recreation possess knowledge and experiences in a wide variety of areas. Several members of the departmental faculty are active in research, in conjunction with the Human Performance Laboratory. Many have professional publications and have presented at state, district, national and international conferences. Many also serve as consultants to various school systems, recreational agencies, mental health associations, sports medicine clinics, health and fitness centers, hospitals, and corporate wellness centers. The departmental faculty are not only dedicated in helping students with their programs of study, but also in assisting them in either continuing their education at the graduate level or in securing employment related to their program of study. Students are strongly encouraged to drop by faculty offices and visit with their advisors as well as other faculty members to discuss academic, career, or other concerns that they may have.